Young Jack was a bit of a daredevil and occasionally got himself into a fix. In 1931 whilst picking up sticks in Sandy Wood with two local children, Jack witnessed the death of his friend Gertrude Joyce Usher when a tree that was being coppiced fell on her and rendered her unconscious (she died later in hospital.) Jack was called as a witness at the inquest. He was close to his nephew John ‘Boy’ Bowen, who was only a few years younger, and the two lads grew up as if they were brothers. Jack was one of the founding members of the Wrotham Heath football club and by all accounts was a powerful player who had the abilities required for a professional career, however prior to the war he found work in the offices at Offham Quarry. At the time war broke out Jack had enlisted in the Royal Air Force Volunteer Reserve and subsequently learnt to fly at Rochester airport. He was eventually assigned to No. 23 Operational Training Unit which had been formed in April 1941 at RAF Pershore as part of No. 6 Group RAF Bomber Command to train night bomber crews using the Vickers Wellington. 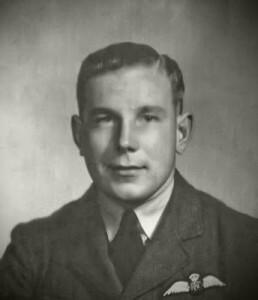 At some point Jack was sent to Canada to train pilots and in May 1943 he was attached to 429 Squadron, Royal Canadian Air Force (which also formed part of 6 Group) at RAF East Moor in Yorkshire. Between June 1943 and February 1944 Jack flew 14 bombing missions over Germany. The first occurred on 21 June when a mixed force of over 700 bombers set out on a moonlit night to bomb the German city of Krefeld. During the attack the entire city centre was destroyed, which accounted for 47% of the built up area. Jack had been flying as second pilot, however the following day he was back in the air again as pilot on an attack codenamed ‘Operation Steelhead’, which targeted steelworks, foundries, engine workshops and rolling mills in the city of Mülheim. Both of these missions formed part of Bomber Commands Battle of the Ruhr. By the end of June he had flown two more sorties against Wuppertal (24th) and Cologne (28th) and three in July over Cologne and Hamburg. During August the squadron flew their last trips on Wellingtons and moved over to using Halifaxes. Bomber Command had hoped that the Luftwaffe would send their night-fighters to a diversionary raid on Kiel, however as the Allied planes crossed the Dutch coast they were met with a substantial number of enemy aircraft, and consequently came under attack all the way to their destination. When Jack’s plane arrived over Leipzig, heavy cloud cover meant his bomber had to circle around whilst the pathfinders found their targets (several planes were lost in collisions during this period.) At 03:12 a.m. LK993 was intercepted 6,000 metres over Gardelegen and shot down. The crew of eight (including Jack) did not survive and were buried in the Berlin War Cemetery.